As the last lights of Sri Lanka’s capital of Columbo fade into the night, the vast darkness of the Indian Ocean sets in. For 600 kilometers, it’s nothing but the velvety black of the sea and a canopy of stars. Then, like a brilliant shower of sparks, the coral island nation of the Maldives appears. Arriving in the Maldives—made up of around 1,200 islands (the number is constantly changing with the season) spread out over 26 atolls—is the oceanic equivalent of reaching an oasis in the desert. While fisherman and traders have long used the port of Malé as a checkpoint, today most accommodations are of the luxury variety—in our case the Four Seasons at Kuda Huraa. Arriving in the pitch black night, there are no lines of cabs at Ibrahim Nasir International Airport, instead suitcases are tossed with care into any size and variety of boat—a swift introduction to life in the Maldives. Not for the seasick or water-averse, as the ocean surrounds you at any given time and water-travel isn’t an option; it’s a necessity. After a half-hour speedboat journey from the bustling (and puzzling) collection of skyscrapers, motorbikes, bazaars and mosques that is the city of Malé, the calm and sense of remoteness sets in. 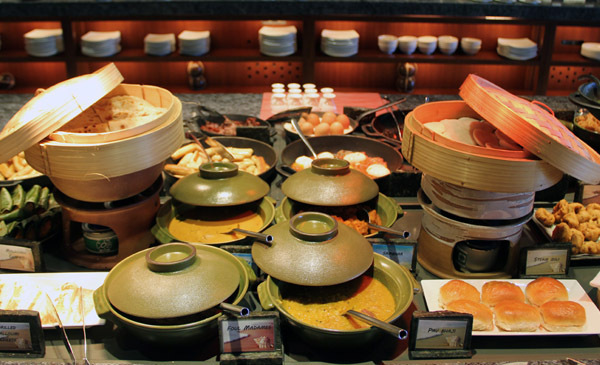 With almost 100 properties worldwide, the Canadian-owned Four Seasons is highly regarded for its emphasis on customer experience and attention to detail. While managing some of the world’s most beautiful properties (Kuda Huraa and the Landaa Giraavaru resort to the north surely top the list) is an already favorable foundation, creating an atmosphere that is high-end but never austere, and comfortable but never lackadaisical, lies in the staff. The Four Reasons is consistently ranked as one of the top employers in the hospitality industry, and just a few days’ stay reveals one of the keys to creating an exceptional guest experience: happy employees. Being greeted with a smile, an ice-cold Lomi Lomi (a tart lime and ginger drink that serves as the unofficial beverage of the Maldives) and a cool towel is the cure for any travel-related stress. A night-time arrival in the Maldives means sunrise brings on a dramatic surprise. The Indian ocean can be heard lapping just outside one’s door from anywhere on the island. Palm trees line the shores of the private island, which translated from Dhivehi, means “little island.” Fragrant flowering plants and fruit trees create natural boundaries between each bungalow and fill the air with an intoxicating scent that mingles with the salt of the ocean to create perhaps the strongest memory one will keep of the Maldives. While lying by one of the resort’s pools or its expanse of private white sand beach is a completely viable way to spend each day, the Four Seasons knows that those who visit this remote locale have a love of adventure inside them. 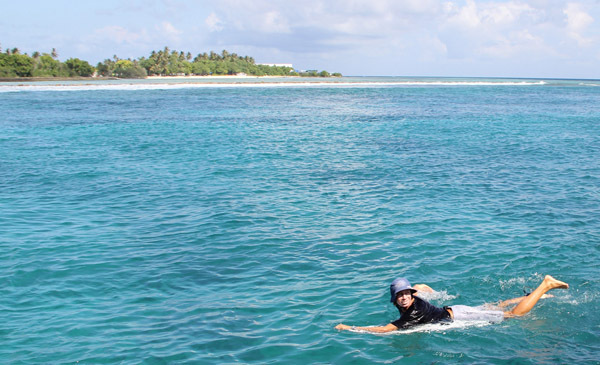 Kuda Huraa has no shortage of activities for those looking to explore the ocean. The major draw at the resort is surfing. A maze of reefs criss-cross the atoll and each tide brings new currents. Local specialists navigate these complex routes and are able to predict which spots will be breaking on a given day and time with the certainty of a clairvoyant. For those looking to improve their surf skills, no better destination exists. There are few places in the world where one can paddle out to an empty, perfectly breaking wave that doesn’t require a thick layer of neoprene to keep warm. Venturing out on a traditional Maldivian Dhoni, guests have the extremely rare option of choosing which wave best suits their ability and preference for the day. Looking for something family-friendly with a gentle take-off and long rides—no problem. Seeking a bit more thrills with a fast barreling right-hander? It’s only an island away. 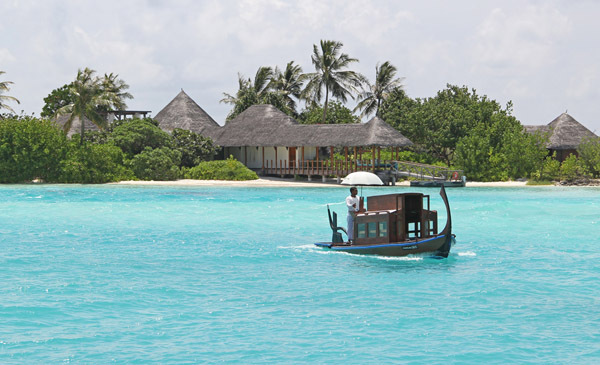 Guests can expect some of their longest rides in the Maldives all enjoyed with their closest friends and family. All of the outfitting is handled by in-house hospitality surf pioneers Tropicsurf. The guides and instructors make sure guests enjoy a worry-free experience on the water—knowing where to go, where to be in the water and with quick tips to step up one’s surf game with no time wasted. Bringing a board can be a hassle and normally results in a few dings, but relying on a resort’s boards can result in disappointment when beginner logs are the only option. Tropicsurf stocks all the latests boards across ability levels and preferences with everything from foam top longboards to potato-chip shortboards to retro fish cruisers. While the luxury aspect may be new to surfing, scoring perfect waves day after day with local knowledge makes surfing in a new place safer and ultimately more fun—especially when currents can change in minutes. 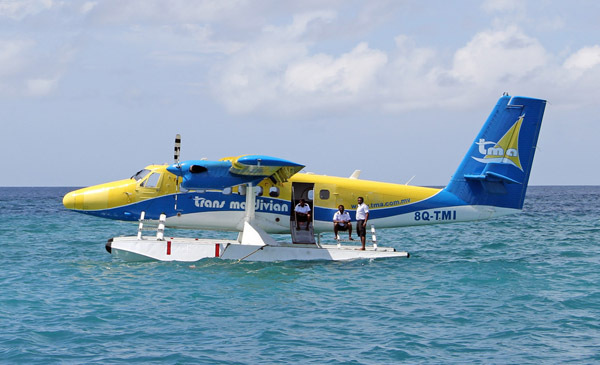 While the trusty Dhoni will get you to dozens of uncrowded breaks in the immediate vicinity of Kuda Huraa, for a truly exceptional experience, Four Seasons offers Seaplane Surfing Safaris. Take off from the hotel with lunch, refreshments and boards en route to some of the most remote waves in the world. (Think of it as heli skiing for surfers.) Pilots and guides keep an eye on the swell to make the most of the day, flying between spots at lunch to make the most of changing tides. 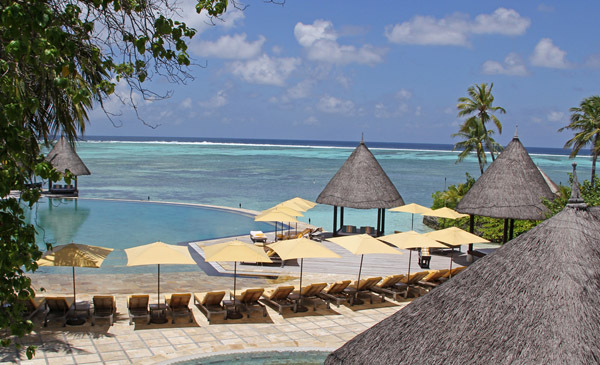 In addition to the spectacular bird’s eye view of the atoll, guests can expect pristine waves all to themselves. Depending on the season though, one might have to share waves with a curious pod of Striped Dolphins. Aside from surfing there are ample activities and opportunities to explore the islands. 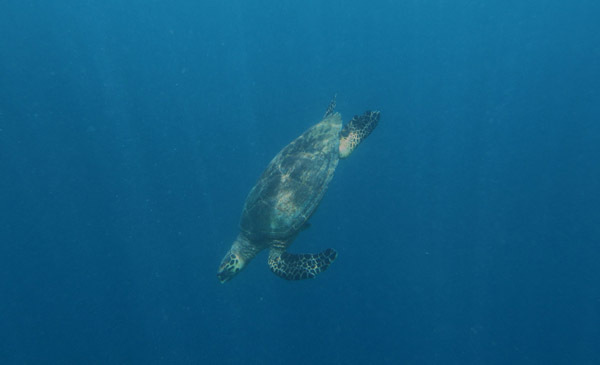 Ocean life abounds in the Maldives, and the Four Seasons is home to several wildlife conservation efforts—from tracking sea turtles, to reef restoration, to hosting oceanographers from around the world at their research facility. ForSCUBA divers, the Maldives offers unparalleled diving and depending on the season, visitors can expect sightings with manta rays and whale sharks. Still, no diving experience is required to get close to nature. With just a snorkel and a bit of luck, we were able to swim with sea turtles and the harmless, nimble black-tipped reef shark. With so many ocean activities, spending time in the impeccably styled bungalows at the resort is mostly reserved for the evening hours. Private and intimate, the rooms offer guests the option of a beachside or water bungalow facing either sunrise or sunset. Of course, there’s no wrong option, but the water bungalows do offer something unique. Glass floors allow guests to watch rays and reef fish drift in the current from their beds. Decks over the ocean with glass-bottomed pools are a water-lover’s dream. With decor blending local Maldivian woodwork and contemporary minimalism, the bungalows are a warm, rejuvenating retreat from the sun’s rays and the perfect refuge for a relaxation day. For those seeking oceanic adventure and discovery far off the map, look no further than Kuda Huraa. 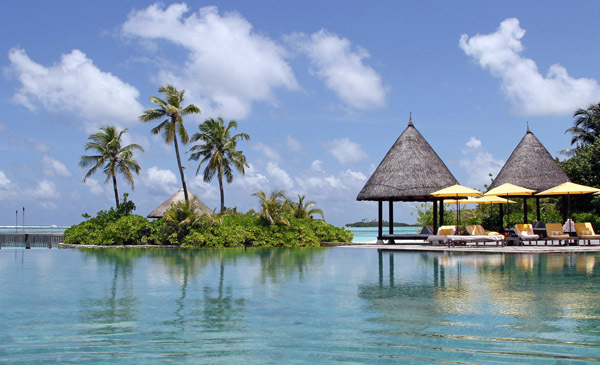 Book a trip to Four Seasons at Kuda Huraa where rooms start at $1,300 per night for two adults. While the islands catch swell year-round, the best season for waves is from April to September.